Visit Richmond Richmond upon Thames, Greater London and the surrounding villages and stay in b and b, hotel or holiday accommodation accommodation provided by BedPosts members. Richmond upon Thames is a borough of Greater London. It is attractive not least in terms of its parks and open spaces including Kew Gardens, Richmond Park, Old Deer Park and Bushy Park. Visitor attractions: Twickenham Stadium (home of English rugby) Hampton Court, a royal palace, and the WWT London Wetlands Centre which is inhabited by many species of birds. 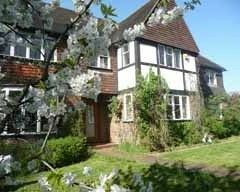 If you seek accommodation near Richmond in Richmond upon Thames, Greater London you have come to the website of a “club” of providers who offer affordable quality accommodation around UK in hotels, bed and breakfasts, guesthouses, inns, and restaurants plus self-catering cottages and apartments .